View every object in stunning detail! 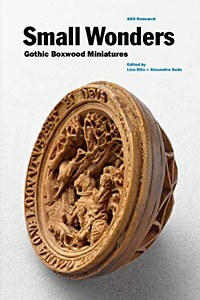 Marvels of human ingenuity, so small they can fit in the palm of your hand, miniature boxwood carvings from the early 1500s have long remained a mystery.The AGO is pleased to debut Small Wonders: Gothic Boxwood Miniatures, a groundbreaking exhibition of more than 60 boxwood miniatures organized in partnership withThe Metropolitan Museum of Art and the Rijksmuseum. Offering new insight into the methods of production and cultural significance of these awe-inspiring works of art, this exhibition highlights more than four years of research that has used cutting-edge technology to understand these elegantly precise miniature rosaries, prayer beads and altarpieces. Featuring ten prayer beads and two miniature altarpieces from the AGO's own Thomson Collection of European Art, the exhibition includes several works which have never before been seen in North America, including the magnificent Chatsworth Rosary (c. 1509–1526), originally owned by Henry VIII and his first wife, Katharine of Aragon. The exhibition is curated by Sasha Suda, the AGO's Curator, European Art & R. Fraser Elliott Chair, Print & Drawing Council; Barbara Drake Boehm, Paul and Jill Ruddock Senior Curator for The Met Cloisters; and Frits Scholten, Senior Curator of Sculpture at the Rijksmuseum. Ongoing scientific investigation into these objects—led by the AGO's Conservator of Sculpture and Decorative Arts Lisa Ellis and The Metropolitan Museum of Art's Pete Dandridge, Conservator and Administrator, Department of Objects Conservation—has been assisted by scientists at the Canadian Conservation Institute, University of Western Ontario's Department of Sustainable Archeology, London's Museum of Natural History (UK) and NASA.